Terma Triga designer electric radiators offer an attractive, user-friendly heating solution for style-conscious spaces, boasting a contemporary flat panel design and bold anthracite finish. The entire Triga range is equipped with a Bluetooth enabled smart thermostat, which allows you to manage your heating with a few simple swipes on Android or iOS devices - making it easy to adjust your schedule or turn your radiators on or off. 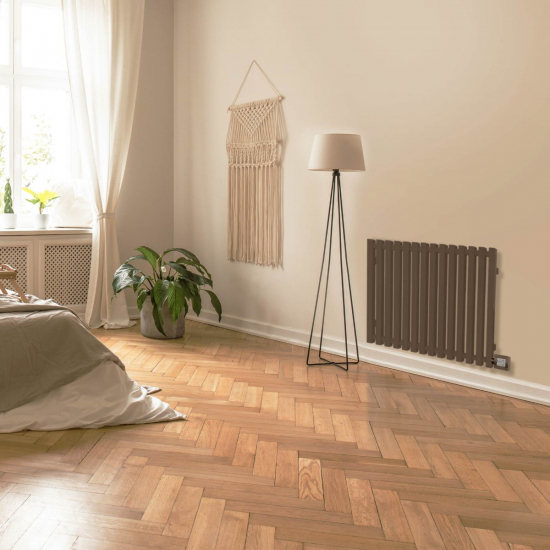 Terma Triga Designer Electric Radiators come with an 8 Year Manufacturer’s Warranty on the radiator body and a separate 2 Year Manufacturer’s Warranty on the electronic heating element. Terma Triga Designer Electric Radiators blend unique heater design with advanced controls, providing a stylish and functional heating system. These horizontal versions of the Triga are finished in anthracite, with white and vertical versions also available.